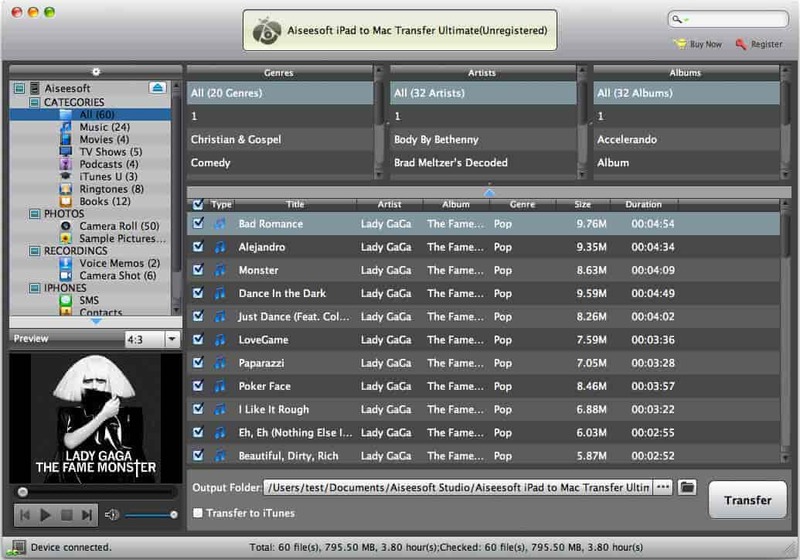 Aiseesoft iPad to Mac Transfer Ultimate is developed to transfer all iPad files, including music, movies, pictures, podcast, iTunes U, TV shows, ePub, PDF, camera roll, voice memos, camera shot and audio books to Mac, and you can also backup them to iTunes easily. This software supports all versions of iPhone/iPad/iPod, and you are allowed to copy iPhone SMS(MMS) and Contacts to Mac. What's more, it highly supports iPad mini 2, iPad Air and iPhone 5s/5c now. This iPad to Mac Transfer enables users to backup all iPad files( music, movies, pictures, podcast, iTunes U, TV shows, ePub, PDF, camera roll, voice memos, camera shot, audio books) to Mac local disk without losing anything. Also you can copy your iPad files to iTunes. With this Transfer, users can copy all SMS(MMS)/Contacts or the specific SMS(MMS)/Contacts on iPhone to Mac without worrying about losing important messages and contacts information. Also you can backup your iPhone SMS(MMS) and Contacts on this program, and then you can delete the specific message, all messages of a specific contact, and even all the backup messages. This Mac iPad Transfer supports multiple portable devices such as iPad mini 2, iPad Air, iPad 4, iPad mini, iPhone 5s/iPhone 5c, iPhone 5, iPod touch 5 and iPod nano 7, etc. The embeded Player of this iPad to Mac Transfer enables you preview movies, songs and picture files on iPad. All iPad info, including picture, type, capacity, version number, serial number, and format, will be clearly shown on the main interface. This Transfer will finish the transfer progress within several seconds, then it will show you the result of succeeded or failed at the bottom of the screen.